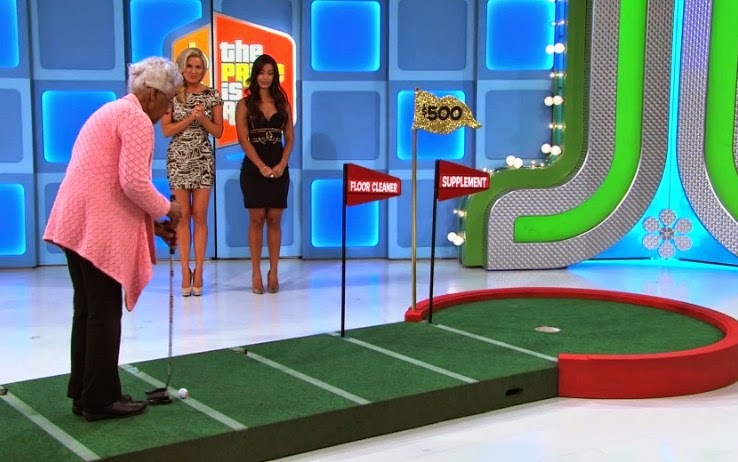 You know how the game called Hole In One works on The Price Is Right, right? You sink a putt, you win the big prize. Yep, that's right, dear ol' Margaret went face-on for her putt attempts. Face-on putting is actually picking up some adherents around the golf world these days. Gary McCord is probably the best-known, and McCord swears by face-on. His buddy Peter Kostis - who learned face-on from Sam Snead back in the day (it was usually called sidesaddle back then) is also a fan. And 84-year-old Margaret is definitely a fan.